The US Energy Information Administration, EIA, has now made a first forecast of the production of oil from the lower 48 states, the states with fracking. As the decline for individuate wells are very steep the rig count will be a very important factor for the future and the number of new wells each rig will drill per quarter. In the figure you can see that the number of rigs will drop down to 1300 and not came back to the level it had in the 4th quarter of 2014. We have seen peak rig count for shale oil in the US. EIA indicate a peak production in 2015 but hope the production will come back. This is just guesses and the price of oil will determine this. The decline in the existing wells might be so large that we in reality will have peak shale oil in 2015. As you can see in the figure the shale oil has been the driving force for the increase of the global oil production. The decline with 4 million barrels per day for conventional oilfields during 2015 indicate that 2015 will show a peak production. Will this be the final global Peak Oil? 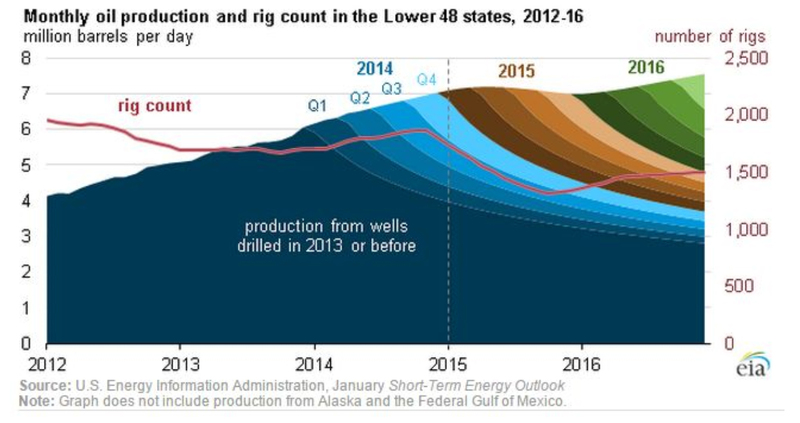 Read the EIA article: Lower 48 oil production outlook stable despite expected near-term rig reductions. and should be appr. the same as the forecast for 2015, means 4 MMboepd. But the increase in production from Shale plays was only appr. 1 MMboepd. From your reasoning regarding peak oil for 2015, that should have occured already 2014. As I understand , we could have had a decline of say 4 MMboepd in conventonal fields. But addition new oilfields ,except Shale plays , have added to the total production. And that could ,or will ,also happen during 2015. That means that Peak oil will probably not take place in 2015. Yes the decline in 2014 was also 4 Mb/d, but as oil price was high in 2013 investments were made in new fields etc and there will be some during 2014 but the added new production in 2015 will be lower. what is produced in the US. According to EIA figures. been more than 1.1 MMboepd.